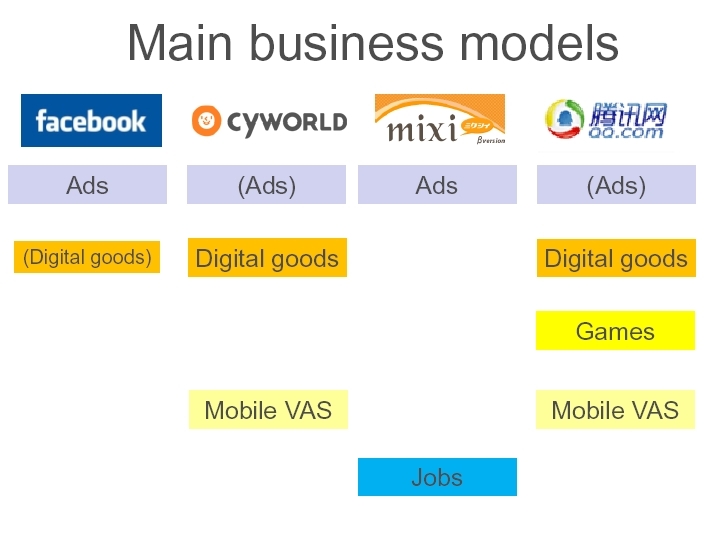 Continuing from what i wrote earlier, the social networks we’re familiar with (assuming you don’t use our friendly neighbourhood sites – cyworld, qq, mixi) have a revenue mix of ads and virtual goods. However, as the chart below will show you, this is not the only way to monetise a social network, as the chart below will show you. Now, should that make our familiar networks hmm, disoriented? :D. Not exactly, because the population is there, even if its lesser than the other sites. The word of caution, is that the audience reaction to monetisation can never really be predicted. Social media is indeed popular, though it is felt that it lacks metrics which are so important for monetisation.That however, has not stopped brands from using the networks in a variety of ways. From making groups to building applications and so on, brands have cashed in on the network’s popularity to hook the customer on one more platform. This, for example is a post on social media marketing strategies. The common newspaper ad sales motto is that they lease their relationship with their customers to paying third parties. While the digital scene has diverged from traditional media in a lot of ways, I’m not quite sure why this can’t be made true for social media. I agree that a lot of applications are also a value addition to the site since they keep the visitors glued, but that can’t be the case always. For instance, look at this application on Facebook by Coca Cola. I doubt if Facebook is making any money from Coke. But the basic questions are ‘Whose platform is Coke using?’ and ‘Whose audience is Coke using?’. And so, why can’t this be a way for Facebook to make money? By all means, allow developers to make applications, but if brands are involved, no harm in asking them to pay. Use part of the revenues to keep users happy by providing better features. That’d be the icing. At the risk of being questioned about what i had for breakfast or about my recent smoking habits, i have decided to post this absurdity. Saw the new Coke ad yesterday featuring HR (no, not the unfriendly department kind or the topi kind, but the Roshan kind). According to agencyfaqs, research stated that a lot of youngsters, after their regular nightlife go to street food joints, thats true for most cities, and since coke goes with most food, that right there, was the thought behind the ad. Fair enough. The line now is ‘Jashn mana le’ as opposed to ‘Piyo Sir, Uthake’ (er, something like that). Meanwhile thats not the absurdity i was talking about. Since HR and Ash are both citizens of Cokistan, how much fun would it be to do an MTV style spoof on the song ‘Jashn -e-bahaar’ from Joe Tha Akbar (copy error, ignore), with a video to match, and use it as a brand ad for Coke? For those who have concluded that I’ve lost it, wonder what you’d have thought if i shared the other idea that also involved Celina Jaitley, the brand ambassador for Jashn, an ethnic Indian wear brand. until next time, I’ve not been on coke! !